A trip from the strip to downtown Vegas will cost you $30 - but the drinks are cheaper here and so is the food. And while you won't get the glitz of the strip, you'll get a slew of stories to tell when you get home. 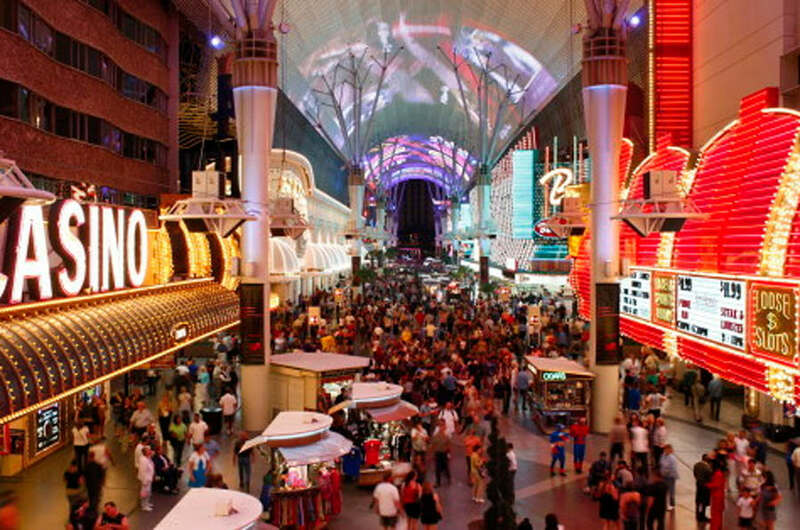 Most people travel to Las Vegas for the infamous strip and glittering nightlife that never ends. But what about Downtown Las Vegas? That tiny little core city where the story all began? I travel to Vegas twice a year for business and while I’ve stayed at a lot of hotels on the Strip (Trump, Vdara, Wynn, Caesar’s), I always make a trip downtown. It’s seedy, a little ugly around the edges and just being there can make you feel better about all your choices in life -- but it’s an experience you can’t get anywhere else in the world. And it can be a lot of fun if you’re traveling with the right crowd. A trip from the strip to downtown Vegas will cost you $30 – but the drinks are cheaper here and so is the food. And while you won’t get the glitz of the strip, you’ll get a slew of stories to tell when you get home. Fremont Street Experience – Strolling the Fremont Experience can be ridiculously cool and depending on the time of night, make you happy – or a little sad – for humanity. There are no filters here and you’ll see all kinds of street entertainment vying for your attention and spare change. Please note, even though you’ll see lots of families, this is no place for young children (or anyone under 20 for that matter). Downtown Container Park – I stumbled on the Container Park area by accident and then couldn’t stop going back each night. It’s a group of stores, bars and restaurants made from shipping containers and grouped in a circle – three stories high. From upscale dining to gourmet hot dogs to the best tacos I’ve ever had (Pinches Mexican restaurant), there's something for everyone. Kids will love the interactive playground featuring The Treehouse and adults can relax while enjoying free concerts, movies, and more on the main stage. The Mob Museum - It’s no secret that Vegas was built on mob money (and blood) and The Mob Museum is a must-see while in the area. It’s governed by the National Museum of Organized Crime and Law Enforcement, which is comprised of former FBI agents, former police officers, historians and experts. Expect a mob-sized education here. The Beauty Bar - Hello, we found our tribe at the Beauty Bar – live music, cheap drinks and a manicure while you sip your martini. Bliss! Golden Nugget – Lately I’ve been playing the hokey pokey with downtown Las Vegas – sometimes I stay there overnight but then other times I want to be closer to the strip. But if I’m downtown, the Golden Nugget is my home – and I only stay in the newly renovated Rush Tower. The rooms are all non-smoking, spacious and clean and I can exit from my elevator with only a few steps to get outside and a waiting taxi. No walking through a stale and smoky casino before business meetings for this girl. Like most Vegas hotels, room service offerings aren’t as good as you get at the restaurant but they’re quick and staff is always friendly. If you’re lucky (or smart) enough to book long in advance, grab a room on one of the VIP floors for some added treats in your room and at the entrance to the elevators. Lotus of Siam – Before the James Beard Award and the Gourmet Magazine review, Lotus of Siam was a hole in the wall restaurant frequented by locals. Visit now and you’re in for an adventurous meal. Chef Saipin’s distinct cooking from northern Thailand consists of hearty herbs and spices, along with Thai style stews and coconut-less curries. Through her set menu’s, guests can dine and enjoy recipes from over 100 years in the Chutima family. Heart Attack Grill – Go for the fun, not the food. Unless you’re actually in the market for a heart attack. The Heart Attack Grill is staffed by waitresses dressed as nurses – a spanking is issued to those who don’t finish their meals – and the cook staff are the doctors. Wine is served in a bag with an IV drip and pole. The menu is organized with selections ranging from the coronary dog to octuplet bypass burger and they boast the highest butterfat content. Bring cash as they don’t accept credit or debit. And if you’re vegetarian, don’t even bother – there’s nothing here for you. If you weigh more than 350 pounds, you’ll eat free – if you dare. Pizza Rock – The Pizza Rock restaurant sprawls on forever but in the middle of the seating, you’ll find the cab of a big rig – I sat right beside it. This is Vegas, baby. But don’t be fooled by the décor – their pizza is life changing. If you can’t finish your meal, take the leftovers with you and give them to one of the homeless people sitting outside the restaurant. Triple George Grill – Keep it cool and casual with a trip (or three) to Triple George Grill. Classic cocktails, live music and the ambiance of an old-world restaurant – the Tadich Grill in San Francisco, serving folks since 1849. The restaurant has won a slew of awards for both daytime and evening dining and they’re best known for their steaks and seafood. Regardless of your tastes – there’s even a few yummy dishes for vegetarians – you’ll have no trouble whiling away a few hours here. The Hash House – Although not exactly on par with the Heart Attack Grill, the Hash House specializes in dishes that could serve as a pre-booking for your cardiac specialist. They excel at farm-style breakfast and brunch adventures – great for hang-over mornings. Plan to skip lunch after your visit – and possibly dinner. Got an old downtown Vegas favorite? Share it with us in the in the comments below or shout out to us on Facebook or Twitter. We’d love to hear from you!